(Photo by Gene Newkirk) Fort Leonard Wood ladder truck personnel work to extinguish the Point Lookout blaze Wednesday afternoon. PULASKI COUNTY, Mo. 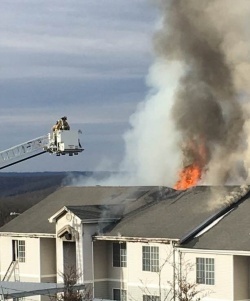 (March 6, 2019) — A Wednesday afternoon blaze badly damaged at least five of eight apartments in an eight-unit building in the Point Lookout apartment complex in the Hickory Ridge subdivision on the east end of St. Robert near the Road Ranger Truck Stop at Exit 163. St. Robert Fire and Rescue personnel were first to arrive on scene and reported moderate smoke showing, with heavy fire showing out the rear on both decks. Additional fire personnel came from Waynesville Rural Fire Protection District and from Fort Leonard Wood Fire Department. An interior attack by firefighters began around 3:48 p.m. While no fire was reported in the lower apartments as of 3:50 p.m., fire was in the brace holding up the second-floor decks as of 3:52 p.m and five-foot flames in the attic of both back apartments as of 3:53 p.m.
"You've got heavy smoke on the interstate, you can see it from Rolla," firefighters said. The Missouri State Fire Marshal's Office was called to investigate the blaze. Additional agencies responding included the Lebanon Fire Department, which sent a ladder truck to the City of Saint Robert, Missouri fire station for coverage. The scene was declared under control as of 5:30 p.m. Red Cross personnel arrived as of 5:44 p.m. to assist the families in the apartment complex.